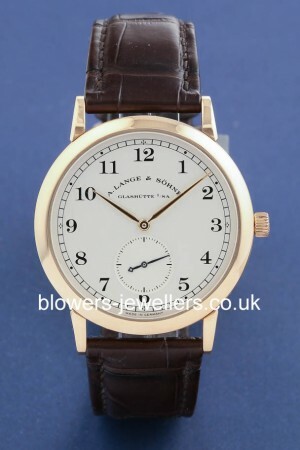 18ct Rose Gold A Lange & Sohne 1815 Ref: 206.032. Hand wound Lange movement. Case diameter 35.9mm diameter, case 7mm depth. 21 jewels; 21,600 vph; power reserve approx. 45 hours. Silvered dial with printed Arabic hour markers and track outer minute markers. Functions: Hour, Minutes, Seconds sub-dial at 6 o’clock. Sapphire see through case back. New brown croc strap with 18ct L&S buckle. Box and papers dated May 2007. Our reference S22101. SKU: 3030022. Categories: Lange & Sohne.